Basketball is the most popular indoor sport in America. 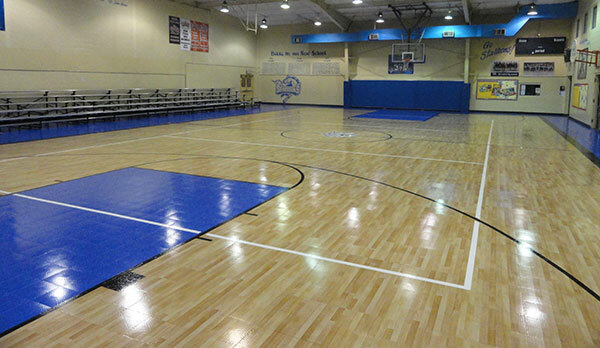 We have installed basketball court gymnasiums and gym flooring for school gyms, home gyms and recreation centers. We are the perfect choice for your gymnasium and gym flooring project. Sport Court® Houston is the official Sport Court® basketball court builder Houston. Contact us today for a free consultation or on-site estimate. Our Maple Select High Gloss modular flooring now looks just like an expensive maple floor, but without the heavy cost and risk of ownership. With a four-coat, factory-applied polyurethane finish, you won't need to worry about re-surfacing your floor every year. Simply apply a maintenance coat every five years and your Sport Court floor will look and play like new and still be unaffected by moisture that may be introduced to the gym. Sport Court® Houston's modular sports flooring systems deliver excellent traction and shock absorption for a wide variety of activities including, volleyball, basketball, dance, soccer/futsal, high school events, middle school events, and elementary school events in gymnasiums and multi-purpose rooms. Modular sports flooring can typically be installed in two to three days, making it an excellent choice to retrofit over any hard flat surface, requiring less maintenance and repair than most other indoor surfaces. Click here to see our gym flooring installations.